The Oakland Athletics visit Comerica Park on Wednesday, September 20, 2017 to play the Detroit Tigers. The probable starters are Daniel Mengden for the Athletics and Anibal Sanchez for the Tigers. The opening line for this matchup has Oakland at -119 and Detroit at +109. The Athletics have a 81-65-4 over/under record and a 80-70-0 run line mark. The Tigers are 68-82-0 against the run line and have a 81-63-6 over/under record. The Athletics have a 67-83 overall record this season. Starting pitcher Daniel Mengden has a 1-1 record with an earned run average of 4.30 and a WHIP of 1.09. He has 14 strikeouts over his 23 innings pitched and he's given up 20 hits. He allows 7.8 hits per 9 innings and he has a FIP of 5.42. The bullpen has an earned run average of 4.66 and they have given up 488 base hits on the year. Teams are hitting .246 against the bullpen and they've struck out 488 hitters and walked 192 batters. As a team, Oakland allows 9.1 hits per nine innings while striking out 7.6 batters per nine innings. They are 23rd in the league in team earned run average at 4.75. The Athletics pitchers collectively have given up 1,344 base hits and 699 earned runs. They have allowed 194 home runs this season, ranking them 12th in the league. Oakland as a pitching staff has walked 468 batters and struck out 1,114. They have walked 3.2 men per 9 innings while striking out 7.6 per 9. They have a team WHIP of 1.37 and their FIP as a unit is 4.57. As a team Oakland is hitting .246, good for 24th in the league. The Athletics hold a .437 team slugging percentage and an on-base percentage of .321, which is good for 19th in baseball. They rank 24th in MLB with 8.3 hits per game. Jed Lowrie is hitting .276 with an on-base percentage of .358. He has 145 hits this season in 525 at bats with 59 runs batted in. He has a slugging percentage of .450 and an OPS+ of 117. Khris Davis is hitting .242 this year and he has an on-base percentage of .331. He has totaled 127 hits and he has driven in 102 men in 525 at bats. His OPS+ is 125 while his slugging percentage is at .518. The Athletics have 1,246 hits, including 283 doubles and 218 home runs. Oakland has walked 537 times so far this season and they have struck out 1,399 times as a unit. They have left 1,004 men on base and have a team OPS of .758. They score 4.59 runs per contest and have scored a total of 688 runs this year. Detroit has a 62-88 overall mark this year. With an earned run average of 7.03, Anibal Sanchez has a 3-4 record and a 1.64 WHIP. He has 84 strikeouts over the 88.1 innings he's pitched. He's also given up 122 hits. He allows 12.4 hits per nine innings and his FIP stands at 6. The bullpen has an earned run average of 5.42 and they have given up 537 base hits on the year. Teams are hitting .278 against the Tigers bullpen. Their relievers have struck out 426 batters and walked 219 opposing hitters. As a team, Detroit allows 10.1 hits per nine innings while striking out 7.6 batters per nine innings. They are 30th in the league in team earned run average at 5.29. The Tigers pitchers as a team have surrendered 1,471 base knocks and 773 earned runs this season. They have given up 203 home runs this year, which ranks 9th in Major League Baseball. Detroit as a staff has walked 494 hitters and struck out 1,109 batters. They give up a walk 3.4 times per 9 innings while they strike out 7.6 per 9. Their team WHIP is 1.49 while their FIP as a staff is 4.74. As a team, they are batting .260, good for 10th in the league. The Tigers hold a .429 team slugging percentage and an on-base percentage of .327, which is good for 13th in baseball. They rank 10th in MLB with 8.9 hits per contest. 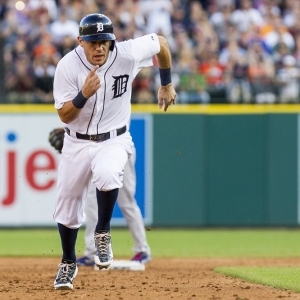 Ian Kinsler comes into this matchup batting .236 with an OBP of .315. He has 122 hits this year along with 46 RBI in 516 AB's. He maintains a slugging percentage of .405 with an OPS+ of 89. Nicholas Castellanos is hitting .270 this season and he has an OBP of .320. He has collected 153 hits in 567 at bats while driving in 92 runs. He has an OPS+ of 109 and a slugging percentage of .485. The Tigers as a unit have 1,338 base hits, including 273 doubles and 177 homers. Detroit has walked 475 times this year and they have struck out on 1,218 occasions. They have had 1,031 men left on base and have an OPS of .756. They have scored 4.65 runs per game and totaled 697 runs this season. Who will win tonight's Athletics/Tigers MLB game against the spread?